Mobile Happenings: Got Your iAd on? Always something new and nifty when it comes to iGadgets and ads for mobile trends. 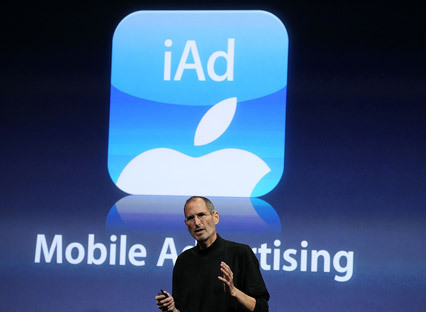 During his public unveiling of the multitasking iPhone 4.0 operating system, Apple hefe Steve Jobs said that his company is “directly targeting” Google with the launch of the iAd platform this June – it will focus on serving ads within the platform’s meaty 185k application environment. The iAd system will not open up a new browser window, allowing users to instead stay within the application they currently have open. The iAd platform also allows advertisers to find out where users are and supply ads relevant to their current location (and this brings up a whole new set of privacy concerns that Apple is going to have to wrangle). Apple will sell and host the ads and these ads will appear as mini-applications that offer free content: movie trailers, casual games and wallpapers. Developers, said Jobs, will retain 60% of the revenue generated. Google is currently looking to purchase AdMob, Quattro’s rival, for $750 million, but those efforts may be stymied by the Federal Trade Commission. The argument against Google owning AdMob, from a regulatory standpoint, could be that Google already dominates the online ad market. Apple’s announcement might actually be a positive for Google in its attempt to secure AdMob, Susquehanna analyst Marianne Wolk wrote in a note. “A second major player investing significantly in the mobile advertising market could assuage the concerns of the FTC regarding Google’s acquisition of AdMob,” she wrote. Right now the mobile ad market is tiny, at $300,000 million, but it could one day dwarf the $20 billion U.S. Internet ad space, Wolk wrote. Google currently holds 10% of the mobile ad market, while Apple has 7%, pretty much making the market anyone’s game. AdMob could boost Google’s share of the market to 21%, Wolk said. It’s looking like the trend for later this year and 2011 will the mobile ad war. A lot rides on the AdMob deal going through – without it, Google has limited mobile display or mobile in-app sales. It appears to have a less significant reach as well, with just 8 million Android phone users and 25,000 apps. In comparison, Apple boasts 185,000 apps and a massive target base with its iPhone, iTouch and iPad.